This is not your typical wine event. It’s Uncorked! This is not your typical wine event. It’s Uncorked! 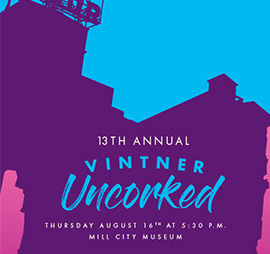 Vintner Uncorked features world-class wine tasting, Minnesota craft beer sampling by Indeed Brewing, distillery sampling from 45th Parallel Distillery and Tattersall Distillery, and unique cocktails from Bittercube. The samplings will be paired with hand selected artisan cheese from Redhead Creamery and gourmet food tastes. All in the beautiful setting of Mill City Museum, where old mingles with new, built into the ruins of what was once the world’s largest flour mill. All event proceeds benefit Second Harvest Heartland, providing food and hope to those in our community struggling with hunger. We hope you’ll join us!